Simeon spent years at the temple waiting for a special baby to come. He had no idea what that baby would look like or how he would recognize him. All he knew, through grace, was that he would not die before he had laid eyes on Israel’s Messiah. So he waited, watched and listened carefully for this child to arrive. When Mary and Joseph presented their precious child in the temple, the Holy Spirit helped Simeon recognize the Messiah in their arms. God had chosen a family of simple means, not one of wealth or prominence, to care for and nurture His Son. Simeon celebrated as he praised God for this new life and the future of Israel. —Light, grace, vision and celebration was his! On, February 2, 1745, Marguerite and her two companions made a solemn promise to God and to each other: to live and die together; to put in common all possessions without holding anything for themselves; to make a “pure, simple, and irrevocable gift to the poor.” They consecrated their time, days, work and lives to labor on behalf of the poor. They, too, were to find God among people of simple means. I was stunned to read again, that this commitment was made just two days after the house they had been living in with the poor had burned to the ground. They had lost everything and yet were willing to renounce their personal wealth. They put it into a common fund to be used for the poor and their own care. —Light, grace, vision and celebration was theirs. Marguerite said, “I look into the eyes of the poor and I see Jesus looking back at me.” Her whole life was a journey of love made visible. Her work and her companions were awesome witnesses to a promise made to love Jesus and to care for God’s poor. She loved with a Mother’s heart and taught her companions to do the same. It seemed that the more life took away from Madame d’Youville–a loving father, a happy marriage, children in childbirth and sickness, her home, her health—all the more she gave to God. Who does that but a person madly in love with her God! —Light, grace, vision and celebration was hers. Renouncing all, women religious today continue to make a gift to the poor, to those of simple means and to each other. We do this for now and into our uncertain futures. May we, the Grey Nuns of the Sacred Heart, trust in the providence of God as Simeon, Marguerite and her companions did. Let us trust in each other enough to let God use us and our resources for the sake of the poor and the care of all, including ourselves. Let us allow light, grace, vision and celebration to fill our hearts in this Year of Consecrated Life. May we continue to be a gift to God’s poor and a witness to each other, our church and our world! For all who live life with a different commitment than Religious life, know that you, too, are called to find God, to share your gifts and to live in love. —May light, grace, vision and celebration be ours today! 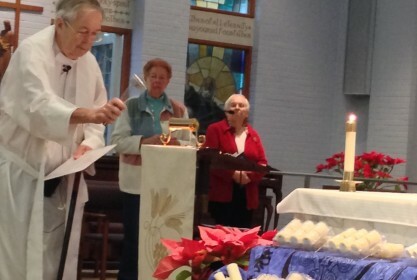 This reflection was offered on the Feast of the Presentation by Sister Mary Elizabeth Looby, GNSH during Mass.